And then we were a few weeks in. After a busy two weeks of returning premieres and first looks at new shows, the new television season is officially in full swing. New shows take the stage and familiar favorites are back after May cliffhangers. And while returning series get the edge over new outings, having at least performed successfully enough to garner a second or third season, new series jockey to find their places in the schedule. Just for fun, today, let’s take a look at how things are looking here, early, with the two-week check-in. Community – After a shaky first few eps last season that threatened an overpromise and misstep by NBC, Joel McHale, Chevy Chase and crew on Community have pulled a Parks & Rec, finishing strongly last season and opening this season with two solid episodes. While the premiere focused on the love triangle cliffhanger (necessary), the second episode of season two featured both Rob Corddry as an unscrupulous lawyer and Drew Carey Jeff’s former boss (who has a hole in his hand) in as solid an episode as the show’s ever broadcast. It’s not too late to get in on Community; it seems to be getting better. The Office – Look, I want to say great things about The Office. I want to tell you how here, on the eve of Steve Carell’s departure, the show is going to be fine because it’s superpowered right now. But — and I feel you, people who don’t want to say anything bad about The Office, I really do — let’s call it like it is: ludicrous. The season premiere opened with a lip synching performance that felt like a camp talent show and featured Michael Scott spanking a grown adult; episode two was a Pygmalion-esque affair in which the office rallied around turning Dwight into a gentleman. Neither tracked, neither felt organic to what this program is supposed to be, and neither was particularly funny. Go ahead, blast that opinion all you want, America. Deep in your hearts, you know I’m right. CSI: Crime Scene Investigators – I wasn’t sure what to make of William Petersen’s departure from CSI; the absence of Holmesian renaissance man Gil Grissom seemed like a death knell for the one CSI show that remains fairly consistently interesting and well-written. But Laurence Fishburne’s replacement has actually worked. Last season’s close saw Fishburne’s Ray Langston stabbed by a Machiavellian serial killer and this season opened with a mysterious bomber. Too heavy? How about murder by shark in a pool in episode two? Right. That’s why the original CSI is the most fun. Accept no substitutes. Saturday Night Live – Let’s face it: SNL’s not going anywhere, but let’s look at it anyway. Successful alum Amy Poehler opened season 36 of the sketch show in an dreary episode which both underutilized her mightily and offered little in the way of freshness. You’re gone all summer and your cold open of the premiere is a Christine O’Donnell sketch? As Poeher and Seth Meyers themselves would opine: Really. Breaking Bad’s Bryan Cranston, however, hosted the second ep in an effort that was as funny as any episode of last season. As always, SNL is hot and cold. When it’s hot, it’s great. When it’s cold, it’s frigid. The Event – Okay, full disclosure: I haven’t watched The Event yet. I have both episodes DVR’ed, but every time I talk to someone about it, they basically just shrug their shoulders. Several have even told me they’re already tapping out. Despite that, ratings seem to be up, so, you know, whatever. All I know is that when I saw the entire cast trotted out to our local Cincinnati NBC affiliate on a lunchtime news program, that seemed kinda desperate for middle America viewers. That’s all I’m saying. I should really watch these and make an informed decision. Outsourced – As our own Christopher Porter so eloquently detailed last week, Outsourced seems like a parody show you might see on another comedy; you watch through your fingers, wondering “how did this get on the air, and why isn’t anyone really complaining about it?” Reception has been lukewarm to dismal, both critically and from my informal polling, so let’s all just hang on and wait for the glorious day Parks & Recreation comes back to reclaim its home here on Thursday nights. 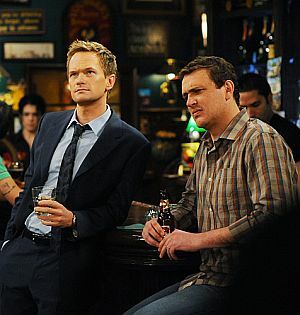 The two best reasons to watch How I Met Your Mother. How I Met Your Mother – CBS’ Monday night first-hour tentpole continues to sail under the expert tutelage of Neil Patrick Harris and Apatow fave Jason Segel, and let’s face it — that’s really the reason you’re watching. Milquetoast Ted still bookends the program in his search for Ms. Right, but it’s the giddy, square Marshall and womanizer Barney that get the best material here. The season premiere hinted at the noticeably absent title character “mother” but detailed the Lily/Marshall baby debate and episode two saw the return of Wayne Brady as Barney’s brother. A consistently funny sitcom that looks to show no signs of slowing in season six. So DVR-able. Trust me. House – A potential shark-jumping scenario seems to have been deftly sidestepped by House’s writers after the season premiere saw the Dr. Gregory House pulling the trigger on a romantic and sexual relationship with his adversary/crush administrator Cuddy. What could have ruined the show, however, seems to have strengthened and breathed new life into it as the House writing staff has decided to take the situation in ways we never could have expected. Wow, kudos for that. This is the time a show starts faltering — and House is actively trying to step is up a notch. Good on ’em. Running Wilde — Yes, I know some of you haven’t watched this yet. Yes, I know those of you who have say it’s not as funny as you hoped it would be. Yes, I know it’s no Arrested Development. But you know what? It’s funny enough and interesting enough to watch — or it’s going to be cancelled, just like Arrested Development. And guess what other show you didn’t watch or didn’t think was all that great in the first two epidodes? Arrested Development. So get on this, people.